during his Forum Ministerial Contact Group meeting in Fiji. 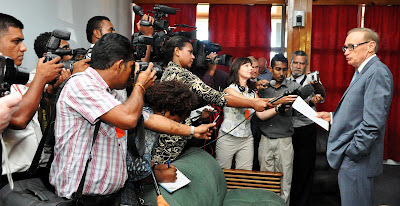 SINCE 2009, the Fiji regime’s decrees, public stance and prosecutions of media owners, publishers and editors, have effectively prevented the media from being a “watchdog” on government. Some media organisations are now largely propaganda arms for the regime. But it is unfortunate that some critics are targeting journalists, who are minor cogs in the media machine. The reality is that journalists are totally under the control of editors and publishers, who in turn are ultimately controlled by the media owners. The real weakness in Fiji’s media industry currently is that Fiji’s media owners are not “dedicated independent media companies”, but corporate entities with much wider business interests which are far more valuable to the media owners than their profits from their media assets. FINALLY, we have the full video of Mark Pearson's inspiring UNESCO World Press Freedom day lecture available on YouTube. This was the inaugural such lecture with the theme "Press freedom, social media and the citizen," delivered by Professor Pearson on May 3 at AUT University's impressive communications "heart" at the Sir Paul Reeves Building. In his opening words, he said: "Firstly I wish to acknowledge the tangata whenua of Tamaki Makaurau and to thank UNESCO and my hosts here at AUT's Pacific Media Centre and the School of Communication Studies for your hospitality this week. "The Pacific region can lay claim to several 'press freedom warriors' over recent decades. It would be a mistake to try to name such individuals in a forum like this because you inevitably leave someone off the list -- and they are usually sitting in the very room where you are giving your address!" And from then on, he spoke on a wide-ranging series of media freedom issues and touched on his new ethical approach to media in a bid to regain our public trust, which he has dubbed "mindful journalism". Pacific Media Centre's David Robie ... “We need to educate the universities." INVESTIGATIVE journalists are calling for new models of funding to fill a gap in the industry where the private sector has failed. 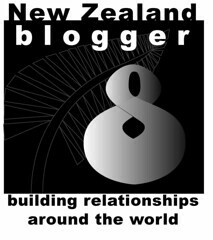 Nicky Hager, author of The Hollow Men and Other People’s Wars, says there is not enough support for investigative journalists in countries like New Zealand. “I hope that one day there will be a return to serious public funding for investigative journalism,” he says. Hager says most investigative journalists do not have much industry training or support. They are often citizens who begin investigating a crime or wrongdoing and do not realise they have become a journalist. 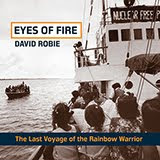 Professor David Robie, director of AUT University’s Pacific Media Centre, believes he has an answer. “As the mainstream media reduces its reporting skills, universities should be picking up the slack,” he says. The United Nations General Assembly has restored French Polynesia to the UN list of territories to be decolonised at a meeting boycotted by France. The resolution, passed by consensus, was sponsored by Solomon Islands, Nauru and Tuvalu last February but not tabled until Friday. It calls on France to intensify its dialogue with French Polynesia to include a fair self-determination process. France withdrew its Pacific territories from the UN list in 1947 and earlier resisted the re-inscription bid by the French Polynesian government. France has immediately condemned the UN move, describing it as a glaring interference in its affairs and a total lack of respect for the choice made by Polynesian voters. IN 1977, when he founded the Tavini Huiraatira party, Oscar Temaru swore to win independence for French Polynesia. Until the latest territorial elections earlier this month, he was French Polynesia's President. The territory also has its own ministers, its own territorial assembly and its local laws. This was made possible by a new status granted by Paris in February 2004. 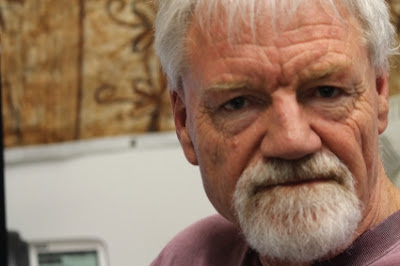 A one-time outspoken Fiji trade unionist, academic, author and commentator, Scott MacWilliam, who believes in free speech declares in an open letter to the Australian Council of Trade Unions (ACTU) president Ged Kearney why he won't be supporting the "Destination Fiji" campaign. UNFORTUNATELY, on this occasion the Australian Council of Trade Unions (ACTU) has the situation in Fiji wrong. As offensive as all democrats find a military regime, the party and trade union opposition to the Bainimarama government in Fiji does not have clean hands either. The trade union officials who are, quite rightly, opposed to many of the restrictions imposed by the regime have been mostly supporters of a political party, the Fiji Labour Party, which is undemocratic, unrepresentative - except of a few cane farmers and long-term party hacks - and definitely not a desirable alternative to the present government. Indeed, the FLP is in the process of forming an electoral alliance with the most reactionary ethnic Fijian/itaukei party which includes all "the born to rule", anti-Indo-Fijian chiefs. The alliance is purely opportunistic and represents a return to the past which produced the military regime in the first place. AT THE heart of a global crisis over news media credibility and trust has been Britain's so-called Hackgate scandal involving allegations of phone-hacking and corruption against the now defunct Rupert Murdoch tabloid newspaper News of the World. Major inquiries on media ethics, professionalism and accountability have been examining the press in Australia, Britain and NZ over the past two years. The Murdoch media empire has stretched into the South Pacific with the sale of one major title being forced by political pressure. The role of news media in global South nations and the declining credibility of some sectors of the developed world's Fourth Estate also pose challenges for the future of democracy. Truth, censorship, ethics and corporate integrity are increasingly critical issues in the digital age for a region faced with coups, conflicts and human rights violations, such as in West Papua. 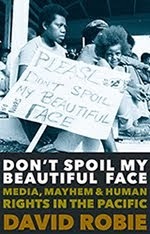 Audio report by AUT student journalist Michael Sergel for the Pacific Media Centre. A LEADING journalism academic has voiced concern at the high levels of digital surveillance facing journalists today and has urged journalists to adopt a new ethical model of reporting for social good. Dr Mark Pearson, professor of journalism and social media at Griffith University and the Australian correspondent for Reporters Without Borders, spoke at New Zealand's inaugural UNESCO World Press Freedom Day 2013 lecture marking May 3, organised and hosted by AUT’s Pacific Media Centre and School of Communication Studies. The lack of press freedom in the Asia-Pacific region was well documented with media in Malaysia, Singapore, Brunei and Fiji needing government licences to operate, and journalists in Malaysia facing 53-year-old “internal security” laws under which they could be detained for long periods for “prejudicing national security”, Dr Pearson said. But Professor Pearson said his concerns were not limited to these cases, and that his major worry was the “ever-increasing government regulation of media and social media everywhere”, including the anti-terror laws introduced all over the world since 9/11, modelled on the US Patriot Act. These laws “typically give intelligence agencies unprecedented powers to monitor the communications of all citizens. There is also an inordinate level of surveillance, logging and tracking technologies in use in the private sector – often held in computer clouds or multinational corporate servers in jurisdictions subject to search and seizure powers of foreign governments”, said Dr Pearson. A LEADING Australian journalism law professor and freedom of the press advocate will give New Zealand’s inaugural UNESCO World Press Freedom Day lecture at AUT University today. Dr Mark Pearson, professor of journalism and social media at Griffith University near Brisbane, will be speaking on the theme “Press freedom, social media and the citizen”, at the university on May 3, observed globally as media freedom day. The public address is being hosted by AUT’s Pacific Media Centre and supported by the New Zealand National Commission for UNESCO and the School of Communication Studies. UNESCO, the UN agency with a mandate for freedom of expression through its Communications and Information Programme, takes a lead role in promoting this freedom as a human right through its celebration each year of World Press Freedom Day. This year’s international theme is: “Safe to speak: Securing freedom of expression in all media”.